Lake Iseo (Lago d'Iseo or Sebino) is located in Lombardy, northern Italy, between the larger and more famous Lake Garda and Lake Como. Like them, it is a long and narrow lake winding north-south and sheltered by mountains. It's a more manageable size, however, and a great destination for travellers who have already visited and appreciated the principal Italian lakes, or simply for holiday-makers who prefer exploring off the beaten track. Although it's not unknown, you will find fewer of your compatriots holidaying here. Since there is an inhabited island in the lake, there are passenger ferries operating all-year-round (although the longer non-essential routes are cut from schedules in winter). This makes Iseo a good out-of-season destination, although you may find restaurants fairly empty and a few tourist businesses closed. We visited the lake in autumn when the wooded hillsides were glorious shades of gold, red and brown. 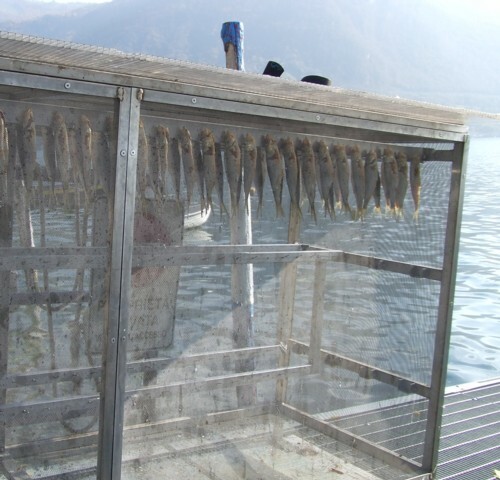 Lake Iseo is full of fish which are served at restaurants all around its shores. It's also a richly agricultural area, with small vineyards, allotments and olive groves stuffed with abundance. Ancient chestnut groves are found on the island's slopes, and in the autumn we found dozens of Italians out gathering sweet chestnuts and mushrooms. As well as fishing, agriculture and tourism, the lake is renowned for the net-making industry. The islanders of Monte Isola in particular are famous for their historic skill at making fishing nets; now they also make other net items like tennis and volleyball nets and hammocks. 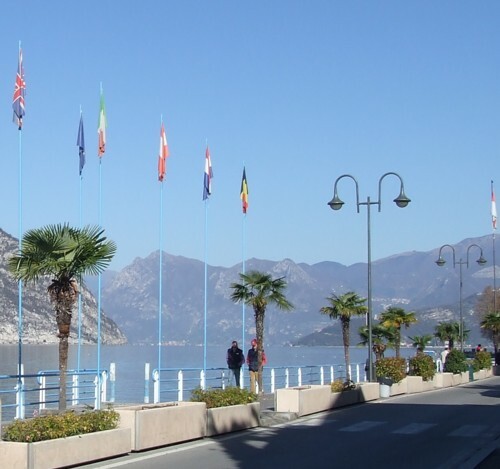 Tourism is most felt in the lively town of Iseo at the southern end of the lake; this is a good place to stay if you want a busier destination, with lots of restaurants and bars. Further north, Sulzano is a smaller settlement which is a base for exploring the island; there are ferries plying back and forth making the five-minute trip. The lake is close to the towns of Brescia and Bergamo (which both have budget airports), and it has fairly good transport connections with a useful little railway running from Brescia up the eastern shore of the lake and through the mountainous valley to the north, the Valle Camonica. This eastern shore of the lake has the most pretty towns; the western shore is steeper and rockier and is unfortunately scarred by a cluster of cement works. Since the lake is not so famed and tourism-rich as the larger lakes, it has been protected rather less - you'll find little outbreaks of industry and unattractive developments, and the medieval lanes, although cared-for, haven't all been prettied-up for visitors. On the plus side, of course, there are fewer hotels, and fewer crowds to disturb the atmosphere. We found local people to be extremely friendly and helpful towards visitors, while along the quieter lanes and paths it was the norm to offer strangers a friendly greeting. 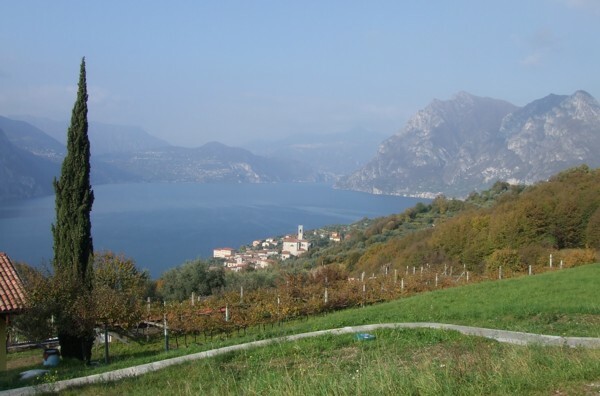 The lake scenery and the large island of Monte Isola are Iseo's prime attractions. Monte Isola (also written Montisola and Monteisola) is basically a small wooded mountain, with agricultural and fishing hamlets dotted around its shores and slopes. Footpaths lead up to the church on its summit, the Santuario della Ceriola. This is quite a nice Italian destination for walkers, with signposted footpaths on the island and also in the hills around the lake. The ancient Via Valeriana contours along above the lake, linking Brescia with the Valle Camonica to the north, and this has been marked and signposted for hikers. Although you will still find awkward stretches of road, there is more awareness of rambling here than you'll find in most parts of Italy. As the lake and its valley stretch up into the southern Alps, some of the mountains are high and walks can be challenging. Most of the lakeside towns have a picturesque promenade, a few interesting buildings and some winding historic lanes. Some of the local churches are very old and contain art that is worth seeing. The town of Iseo has the most actual tourist attractions, including a lovely unfinished church dating to the twelfth century. Mostly though, these are resorts where you can potter around, sit at a pleasant cafe, take photographs, admire lake views and then enjoy a fine meal, perhaps of lake fish. Most towns have access both to the lake with ferry services, and to inland walks. They're connected by rail and bus services which is a help when the ferry services are reduced in winter. There are some interesting tourist attractions around or in easy reach of Lake Iseo, including some rather unusual sights. High above the lakeside town of Marone is a cluster of 'pyramids' - bizarre geological formations where erosion has left tall earth pinnacles surmounted by boulders, like high skinny mushrooms. The valley at the head of the lake, the Valle Camonica, heads into the southern Alps and is dotted with remarkable rock-carvings covering thousands of years, from prehistory to the arrival of the Romans. At Capo di Ponte, on the Brescia - Iseo - Edolo railway line, there is an archaeological park where you can view lots of these fascinating etchings. At the southern end of the lake is the Franciacorta, a pretty area of countryside which is famous for its wine: with vineyards, monasteries and villas to admire as well as a wetland nature reserve. The large towns of Brescia, Bergamo and Verona are all fairly easy to reach for a spot of culture and museum-visits. Although it's a good spot for a longer relaxing holiday, Lake Iseo also combines well with one of the nearby cities to make a contrasting two-centre holiday - consider moving on to Verona, Padua, Milan or Venice. Brescia and Bergamo are the two nearest large towns and the gateways to Lake Iseo. Both have airports with budget flights from the UK, and so the easiest way to travel to the lake is to fly to one of these airports, take the bus into town, then travel onwards by train or bus. From Brescia there are buses and a local train service running up the eastern side of the lake, stopping in all the towns and villages including Iseo and Sulzano. Some of the services continue up the Valle Camonica to Edolo. Brescia has its own budget airport (served by Ryanair as 'Verona Brescia'), with a bus connection to the railway station. Brescia is also on the railway line which connects Venice, Verona and Milan, so it's easily accessible from the rest of Italy. Note that the Brescia - Iseo railway line is not part of of Italy's main rail network. At the time of writing you can't book 'through' tickets via Brescia online or at self-service ticket machines in Italy, although manned ticket desks should be able to oblige. An alternative is to book a ticket simply to Brescia, having checked the connection times for the Brescia - Iseo trains (available online). Tickets for the branch line can be bought in a special biglietteria at Brescia station, by the Iseo platforms, which are up past the station buildings. The local trains run reasonably frequently; there is usually at least one train an hour. If you do have to wait between trains at Brescia you can get decent cheap refreshments at the station. Bergamo provides access to the western shore of the lake. Again, the town has a budget airport (Milan Bergamo), and also has easy transport links from Milan. Buses from Bergamo bus station (stazione autolinee) run to Sarnico at the south-western end of the lake (just under an hour's journey time), sometimes continuing up the shore to Predore and Tavernola. Other services run to Lovere in the north. For details of buses from Bergamo and also along the Bergamo (western) shore of the lake, see the 'Bergamo Trasporti' link in our links panel on the right, and use the 'Ricerca orari' search box to find timetables. If you are travelling from Bergamo to Iseo, Sulzano or the other resorts on the eastern shore, the easiest option is probably to take the airport bus that runs to Brescia station, and catch the branch line from there.